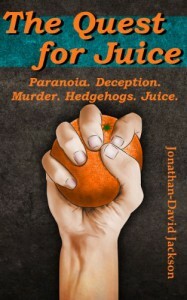 Jackson's The Quest For Juice was the first winner of my 'one per month' self-published review draw for July. I really shouldn't have read it this soon because there are at least forty-seven other things I'm meant to be doing, but I was so intrigued by it I picked it up and then couldn't put it down. I'm miles out of my comfort zone with this title, in the sense that it's not the sort of thing I'd normally read, at all. When it comes to paranoia however, this is the perfect book for me! As someone who suffers from anxiety, The Quest For Juice hit me on several levels, and I was completely taken in and slow to see the twist coming. I was able to draw some really quite terrifying parallels between myself and Oscar, and this afternoon in the office I even found myself Googling the name of the drug he was taking. Oscar's view on life is fascinating. To me, at least. I do wonder though, if readers who haven't had a brush with anxiety and paranoia of their own might falter. Having said that, parts of this read like some kind of 'for the masses' collaboration of Beckett and Pinter, and they work on any level, so, who am I to judge? "There were pieces of sentences you could still see on those abandoned papers; a lone noun here, an adverb lying forlornly there with no verb left to modify." It is, as advertised, "Darkly comic" and surprisingly violent and disturbing in places.It's a hard title to review because, it's just so...out of the ordinary. Which is a Good Thing, don't get me wrong, but I'm struggling to find anything concrete to compare it to. It's essentially a simple, fast-paced, linear tale but what makes it stand out is Oscar's narrative voice. It's absolutely compelling in its charm. Oscar's is a fresh voice, and a strong voice. There's an effortless style to him that makes him infinitely readable. In many ways this is the kind of title I can imagine gaining cult status, he's that strong a character. I know there's a second book in the works, but this doesn't stop me wanting more for the first one. It ends on a surprising revelation, and there are so many questions left unanswered that I felt a little lost and cheated. I'm sure Jackson will make this all better with the next instalment, but still, I'm suffering in the here and now!